dream state but when I wake up I am filled with revulsion. his hind feet between his claws. to describe something with which they are familiar but to me is gobbledy gook. so good. The lump seems to be getting better. the middle of my cleavage. said surgeon chopped out the growth. was from sight and touch. little concerned about possible scarring. scar – then I must get back to him. So my dreams have come true. appearance of lichen as a direction finder. hemisphere it’s the other way around. barnacles, a sign of aging no doubt, but also of what? body gone wrong, especially on the surface of the skin. her immediate response was one of ‘yuk’. my husband’s body and more recently they’ve started to erupt on mine. can see from the outside in, and the surface of my skin is as transparent as glad wrap, or as barnacled as the bottom of a boat. You are not alone, Elisabeth. I have been pre-occupied with all the undesirable barnacles that keep popping up all over my body which my medical knowledge tells me are inevitable, but my vanity says is unacceptable. My general term for them all is 'body mould' and I am presently trying to decide whether to see a Dermatologist or learn to live with them. I know none of them are suspicious – or sinister, as the medical world term them, making them sound even more 'witchlike' but my most irrational fear is that they are the sort of things that turn children off old people. How absurd is my thinking? I don't mind having more birthdays, but damn old-age! They weren't there yesterday, so when did they suddenly grow? I'm not at all squeamish or repulsed by this. My own body has enough lumps and bumps and oddities to render me numb on the subject. The infected lump in the dog's paw may be a grass seed lodged deep within and working its way out. I would have called them beauty spots. My experience with lumps was the removal of polyps during an operation called polypectomy at the hospital. The worst part was having to wear a gown with the back tied with strings but more or less open. Then having to walk past staff and other patients and crawling into the bed. I am fond of lichen on tree and rocks. More than fond. I find it fascinating and beautiful. On myself or indeed on other people? Not so much. I spent thousands of dollars to remove the barnacles off the bottom of my boat that I know will only grow back as soon as I put it back in the water. Oh well.. Very cool post, Elisabeth, and terribly interesting. I have a hideous mole on my scalp, under my hair, that is non-cancerous but pinkish and large. My son Oliver says that it's a piece of my brain on the outside of my head and loves to look at it and then scream. I have a Lichen on my shoulder blade that appeared 20 or more years ago it never got any bigger or thicker and its not painful. After consulting my doctor at the time he said not to worry about it so i haven't. At my age i've lost count of the number of scares i have. I reckon scares are a testament to prove that you have lived :-). I have what my wife calls a naevus in the centre of my forehead which I was not born with, a wart on the middle finger of my right hand that sometimes annoys me and a lump of some sort on my right leg where I had a spot what never went away and I’m not sure what you’d call that. I’d love to say that other than that my skin is as smooth as a baby’s but that’s not the case. I still get more pimples than I ever imagined I would get by this time of my life. I never suffered especially as a teenagers but I have a strong revulsion to them and have never been able to leave them alone; I have to burst them. One of Ian McEwan’s early short stories haunted me … well, to this day if I’m being honest. It’s called ‘Conversations with a Cupboard Man’ and revolves around a conversation between a social worker and a man in a cupboard. That part’s interesting enough but it’s a fairly minor character in the story that upset me: ‘Pus-face’, his onetime boss. I’ve known some cruel nicknames in my time but, for me, that one tops the list. It’s rare of me to visualise the characters I’m reading about but I had no problem with that one. If they ever dramatised it I doubt I would watch it. As a kid my siblings and I all suffered badly from heat spots, not just one or two of the buggers but dozens on our arms, legs and torsos. I hated them but at least for the most part they could be hidden under clothing. What I loathed so much about pimples is that they had no respect; they would appear anywhere and anything that drew people’s attention to me in a bad way embarrassed me; I’m still like that. You were wise to have that thing seen to. Carrie had a lump at the side of her nose removed a few years back which was cancerous with the unsavoury name “rodent ulcer,” a type of basal cell carcinoma; her second cancer, the first being ovarian. With her condition she has numerous skin blemishes but as they’ve arrived gradually I can’t say I notice them anymore. The nose looked awful for a while but you’d never know there was ever a problem unless you compared photos of her nose before; there was a little remodelling required. I’m not sure how I would feel about cancer. If I can’t handle the odd pimple I’m not sure how I would cope with something that was setting out to disfigure and/or kill me. I expect I’d be screaming, “Get it out of me! Get it out of me!” Maybe not. As for poorly pets there’s nothing worse. Lichen I have no strong opinions about. I just wish people could agree how to pronounce the damn word: lie-ken or lich-en. Oh that we could retain the skin of our babyhood. No wonder that smooth youthfulness is used for advertising. I remember a stand-up comedian once lamenting, "When you get older, you start to have things growing all over you!" It got a big laugh. I try to take them in stride, but it just isn't fair to have brown spots, wrinkles AND pimples! I'm just grateful that the bad posture of my youth never resulted in that hunchback my parents so warned me about. I can relate to every word of this. Enjoyed the writing.. You now have me thinking about my aging body again. You've set me musing on all the different skin changes I'm noticing, and the tactless names that skin specialists have for them. 'Over healing': what a strange concept. So instead of helping your scar to heal, you would be wondering about how to get it to 'under heal' and so come out neutral. All very bewildering when it comes to making choices. Fortunately my skin specialist likes to leave everything alone, except it it's a basal cell carcinoma. Wishing you a successful half healing! 'Body mould seems to me to be a great expression for such growths, Karen, rather like the things that pop up in a neglected bathroom. Without medical knowledge I cannot say for sure that all my lumps and bumps are non-sinister, therefore I take each new uprising for examination. I am grateful that so far none have been seriously problematic. All that sun damage I endured as a child before we knew better. It's clearly a mixture of the two: aging and excess exposure to the sun. The vet thought this might be the case, River, a seed lodged deep in the dog's paw but she didn't seem to want to poke around. She wanted first to clear up the infection. If the dog were human he might be able to tell us what's wrong, as we try to tell our doctors what ails us. As you say we probably need to get used to the onset of age related lumps and bumps and not be too distressed about them, given they're a fact of life, if lived long enough. I recognise the ignominy of the hospital gown, Gerard. I'm sure most of us do after we've had a spell in the depersonalising environment called hospital. As for calling these barnacles beauty spots, that's not a bad idea. It takes the ugliness out of them even if in joke form. The beauty of lichen on trees and in gardens is, as you say another thing when attached to the human form. It seems you share my perception, Elephant's Child. It's the idea of it more than the reality rather like having worms. As my daughter says : yuk. Barnacles on the bottom of boats grow back, Fazlisa, hopefully not too fast otherwise it'd become a very expensive procedure but not perhaps as expensive as the removal of barnacles from humans. Oliver's description of that mole on your head, Elizabeth, is wonderful. Fancy the idea of a bit of your brain sticking out. Children see things so well, but I suppose it's best not to take it too literally or personally. I'd agree Windsmoke, these scares – or did you mean scars? – are a type of testament to the fact that we've lived. That lichen on your shoulder sounds like a real war wound of life. As for pimples and the description you offer of 'pus face', I can well understand your revulsion here. Pimples seem to be a thing of the past for me now, but I certainly remember them, and my daughters still suffer the occasional outbreak which distresses them. Still I'd rather suffer the occasional pimple to these potentially cancerous growths any day. It also depends on where it's located. On your face is probably the worst place given its visibility. It must have been hard for Carrie. You're right, Steven. We tend to get caught up in our lumps and bumps when more often than not they're invisible to others. It's as of we feel them on the inside- gigantic – like a tongue seeking after a cracked tooth. And even baby skin these days, Andrew, is prone to eczema and all sorts of aberrations that show up on the surface of skin. The skin is a membrane and it reflects what's going on inside, including aging, health and allergy. I agree, Ms Sparrow. It seems unfair. All those things that can go wrong with our skin over the course of our lives, and especially through aging. And still we suffer the adolescent angst of pimples. Parents have a funny way of warning us against the worst, Kirk, and sometimes in the process they can create greater problems, perhaps like your fear of developing a hunch back. I imagine a large bony lump in the middle of your back and spine that causes you to hunch over is worse by far that the occasional age driven barnacle. I'm glad you can identify. Thanks, Ms Moon. Sorry that I keep reminding you of your own aging body, Anthony. For me it's an occupational and age related hazard. I write what comes up for me and every year it gets louder. The skin specialist would have left this one alone, too, Juliet except that he wasn't quite sure what it was. If he'd known for sure it wasn't one of those basel cell carcinomas he might well have left it alone, too. That's often the best way. Am following you now that we are fellow students. 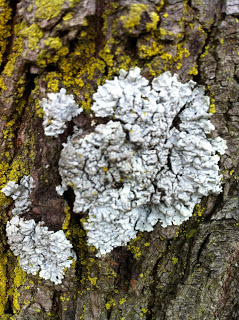 I like the look of your blog – and lichen too. Mine is a work in progress. It's good to see you here, Amanda. I checked out your blog last night and tried to leave an email for you but I could not get through the letter verification process and gave up. I'll try to leave a comment on your blog instead. Thanks, Amanda. Such an interesting post but it filled me with dread because I have a friend who has just been diagnosed with an aggressive breast cancer and there was no lump or outward growth, just a few calcified spots on a mammogram and then deep inside the breast a handful of malignant cells multiplying. We don't know what happens at cellular level, that is why so much is invisible and not tangible, harder to understand. I am quite glad of the moles and age spots and lichens, because they can be seen and diagnosed. Because I grew up (like you) in a hot climate we spent years lying around in the sun beside chlorinated pools or walking out on the veld with just a little sun cream or a floppy hat and my skin has paid the price for it. I wish we had been warned. Year ago I went to my GP to find out what a tiny lump in the middle of my back was – he diagnosed it as a lipoma – a piece of fatty tissue, no problem. To remove it would be unnecessary unless it grew. I guess for years I ignored it, so it grew – eventually (15 years later) I had it removed, it was 12cms long 8cms across. It was totally benign but it had started to push onto the nape of my neck, only when it was gone did I realise I had been suffering from a headache for years! Wish I had had the sense to get it removed on my first visit. Now I check regularly for a recurrence but all the 'dimples' one acquires make it difficult to detect one fatty lump from another. I think there's something about our fascination with our own injuries and scars but the revulsion when asked to look at someone else's. I was always the kid who'd peel back the bandaid to see how my scabs were doing, but squealed if my brothers did it. No 'senile warts' on me yet, but definitely some sun spots on my temple and jawline that weren't there last year. And why do pimples still come – if wrinkles and liver spots are here, can't the zits at least give me some peace? I, too, wish we were warned as children about the impact of sun damage to skin, Mary. My children use skin block all the time and rarely sit out in the sun. I regularly sat in the sun and coated myself with coconut oil – all the better to fry myself. no wonder our skin suffers now. You're not the first to ask this question, Kath. Why must we still endure zits when our liver and aging spots start to appear? How can an adolescent ailment sit so close to an old person's problem. It seems terribly unfair, but equally the incontinence of extreme old age and illness has its parallels in nappy wearing infancy. It can be tough having a body, especially at either extreme of life. I love the lichen photograph … and the underlying humour in your writing, which appealed to me. I loved, too, your focus on 'uncanny'; it is an odd word and perhaps apt in that. Keep on writing your unusual posts (which are not 'uncanny') – I so enjoy reading them. I'm enthralled by the notion of the 'uncanny' too, Aguja. I'm glad you find humour in my writing. I can't say I intend it, but I often feel a strange sense of wanting to take things lightly however serious I might feel. Life can be a bit too extreme otherwise. I didn't know that it was called lichen, you learn something new everyday! Trees are so beautiful, one of the few things that become more beautiful with age!